After a long weekend of work and family obligations and a long night of soothing her sick toddler, the best part of the Rev. Colleen Preuninger’s Monday morning would normally have been a steaming cup of coffee. Not this past Monday morning. This is $29.40 worth of food, the amount that is supposed to last a SNAP recipient for a week. Preuninger, United Methodist Ecumenical chaplain at Syracuse University, is one of many local faith leaders and community members participating in the CNY SNAP Challenge, Feb. 9-15. 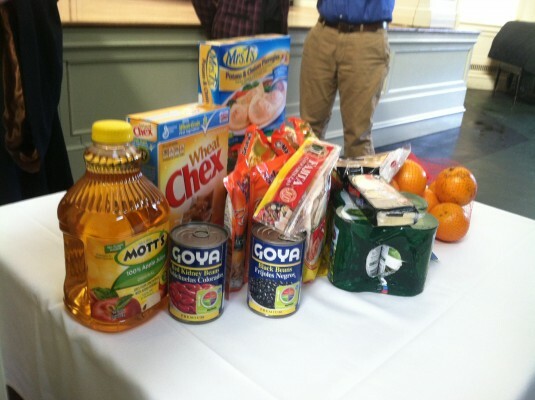 The challenge, facilitated by the InterFaith Works of CNY Round Table of Faith Leaders, has encouraged individuals to live this week on a food budget of $29.40, the amount that individuals receive through the Supplemental Nutrition Assistance Program (SNAP). With limited funds, non-essentials such as coffee were among the first things to go for Preuninger. “Whether it’s a morning coffee, a cold Diet Coke with dinner, or a square of chocolate before bed—even the small comforting ‘extras’ are not possible when you have to stretch $29.40 to fill the entire week. It’s a stark reality when a cup of coffee becomes a luxury,” wrote Preuninger in a blog about the week-long experience. SNAP has been a frequent target of deep cuts in state and federal budgets in recent years, despite the fact that the need for the program is supported by sobering statistics. According to Feeding America, more than 47 million low-income Americans participate in SNAP to help purchase food, and 76 percent of SNAP households include a child, elderly person or disabled person. According to the U.S. Census Bureau, 56 percent of Onondaga County lives below the poverty level, and 40,745 households in the metropolitan Syracuse area use food stamps. “This is the second year that the IFW of CNY Round Table of Faith Leaders has spearheaded the SNAP Challenge for our community,” says the Rev. Tiffany Steinwert, dean of SU’s Hendricks Chapel, who is co-chairing this year’s challenge with Rabbi Dan Fellman of Temple Concord, SU’s Jewish chaplain. “Today more than ever, families are struggling to put healthy food on the table. Since last year, the SNAP benefit has been slashed by nearly 10 percent while food costs have continued to rise. I was amazed at how much less my SNAP allotment purchased this year as compared to last. This year I had no money for fruit, no money for coffee, no money for milk, no money for even an afternoon snack. The difference from last year to this year is a stark reminder of the plight of hungry families everywhere. “By participating in this challenge, we stand in solidarity with those across Central New York who rely on SNAP to feed their families. We hope by raising awareness people might lobby their representatives for increases to SNAP benefits, donate funds to relief agencies or volunteer in their local food pantry. We can solve the problem of hunger in our communities, but we can only do it together,” says Steinwert. Participants are blogging about their experiences. Visit the blog at http://www.cnysnapchallenge.org or join the conversation on Twitter at #CNYsnapchallenge. To conclude the week, through its Better Together initiative, Syracuse University and Hendricks Chapel will hold its annual Can It! donation day at the Carrier Dome at the SU men’s basketball game on Saturday, Feb. 15, at 3 p.m. to collect nonperishable food items and money for the Food Bank of Central and Northern New York. Kathleen Stress, executive director of the Food Bank, says the face of hunger has changed in recent years, and now includes more families, seniors and veterans than in the past. SNAP Challenge participant Alan Thornton, CEO of the Syracuse Rescue Mission, blogged that his whole family is taking the challenge, and a smaller budget has meant fewer options when planning healthy meals. “The first thing I realized quickly was we have very little margin to work with. We knew buying a family pack of ground beef would get us through at least two dinner meals but the difference between buying 80/20 for $13 or 90/10 for $20 was $7, or over 10 percent of our budget, so we opted for the least healthier option. When buying a loaf of bread we did the same thing, opting for the larger, plain white loaf for $1 instead of the much smaller multi-grain for $2. These two situations are just examples how much more difficult it might be to choose healthier options just because of the cost,” he says. “I recognize that my participating in the SNAP challenge is a small attempt to understand the harsh reality for many of our neighbors. I am experiencing a sliver of their struggle. The individuals who make it work on $4.20 of food, every day, are the real story,” says SNAP Challenge participant Mike Melara, executive director of Catholic Charities of Onondaga County. SNAP Challenge Nx Conf from Syracuse University News on Vimeo.